What happened to out Texasbowhunter clan in Clash of clans? Wish I knew. Sounds interesting, I never saw the thread...??? Sounds like someone dreams in color... Green. Never heard of such a thing. Me tinks u be sleep green screening. Restart your app- must be a glitch. I was playing this morning before sunup in the stand and all was well with the clan. I'm about to give it up I think though. Gotten to where I can't find ANY raids that net a profit. I spent thirty minutes this morning looking and only came across a handful with a worthy amount, but were so heavily fortified I stood no chance of success. Last edited by bearintex; 01-05-2014 at 10:14 AM. Ok what were the details on the game again? Back when everyone was talking about it I only had android, now I have my iPad! I wanna join the fun! Guess I could just search for the old thread!! Hmmm.. I guess the clan is by Texasbowhunters ? CoC is interesting at that be seeing the TV commercials for it. I guess I need to do a search for the clan. So I started playing, but how do it get on the TBH clan thingy?? What is the name of the Clan? I found a texasbowhunter2 that has 1 member and about 7 TBH clans. I didnt know we had a clan, As soon as I find the right one I will join. The Clan is Texas Bowhunter. Must have 1000 trophies to join and commit to 200 troop donations a week. Jeremy, have you advanced far enough to rebuild the clan castle? I sent in a request to join. See you on the inside!! What is your username? I will prod one of the elders to let you in. Never mind- see you're in already! No not yet. I'm trying! I guess it takes a awhile unless ya buy the stuff. You have to rebuild the clan tower before you can join one? "I must be getting old"
Maybe they kicked so many people out that the clan went away? I was going strong, then left for a week and had been removed. Takes forever! Unless you buy stuff. I have yet to be able to fix my clan house thingy. Do y'all have any tips of how to get the clan house fixed without paying for stuff?? Maybe y'all got taken out by the Dallas Dodge clan? Take it slow and steady. 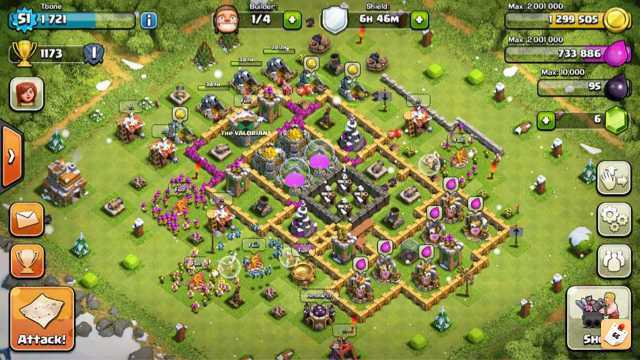 You need to get your elixir and gold mines upgraded as fast as possible. Storage as well. Don't waste gems on upgrades. You will need them later for a builder. Don't upgrade your town hall until you have built and upgraded everything else to the max. The higher you get in trophies and town hall level, the harder it gets to find raids that will profit. Ha. Yeah. Well I've almost got the 40k to get to the clan. I already used all my gems though. Lol. Dangit. Sent ya a Pm JC. I finally got it! Is there any way to start over from the beginning? Not without changing gamecenter login or going to a new device. I would love to start over. I would also like for there to be the option of multiple game profiles within the game on the same device. Like an iPad, my son has his game going on there, I would love to be able to easily put mine on there, it makes rebuilding the village soooooo much easier on the large screen than the iPhone.